German company Speedlink isn’t the most well-known peripheral maker, but that doesn’t mean they can’t make an excellent piece of kit at an attractive price point (for example, their rather good Kudos Z-9 mouse). Today, we’re looking at another PC gaming peripheral with a good amount of potential: their Medusa 5.1 USB headset. If Speedlink could deliver sound and comfort at a reasonable price, they might be onto another winner… but sadly the Medusa 5.1 doesn’t deliver. 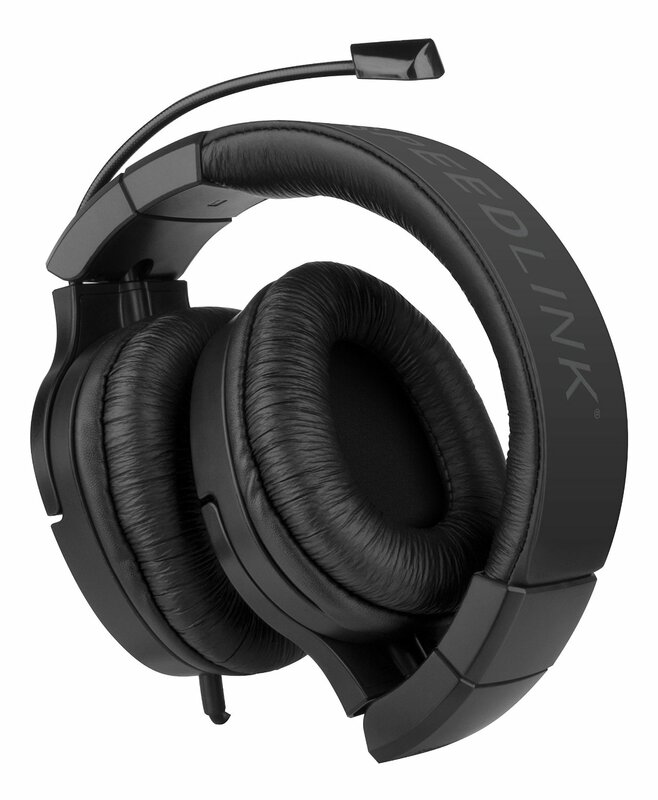 Speedlink’s Medusa 5.1 headset falls short of the mark, with its uncomfortable design and underpowered software scuttling an otherwise good-sounding, full-featured headset. The replacement ear pads seem like a terrible trap too, proving easy to remove but incredibly trying to actually install. Speedlink found our favour with their underrated Kudos mouse, but their Medusa headset has turned our hearts to stone. 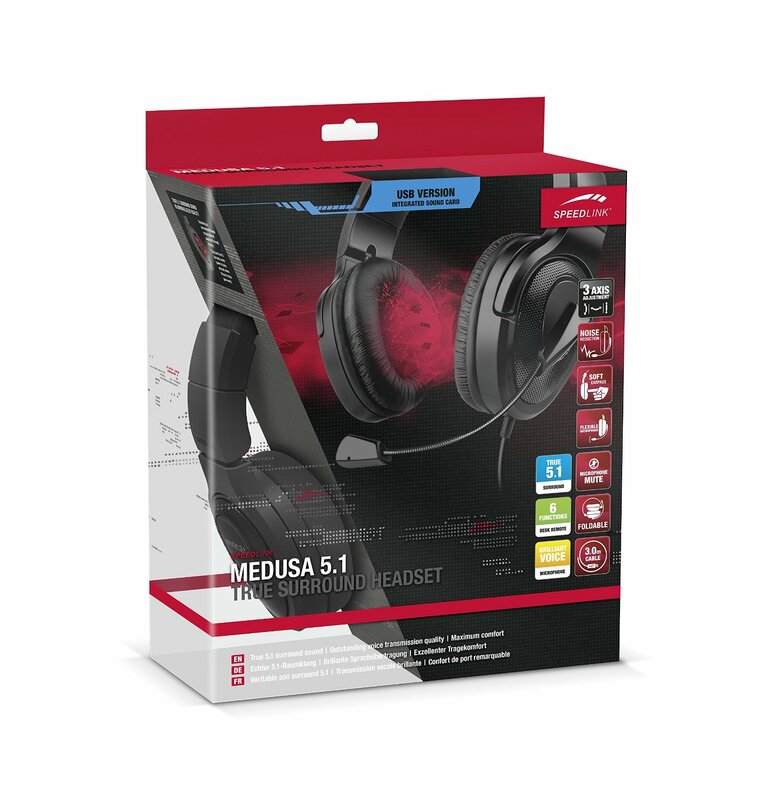 The Medusa 5.1 USB looks like a solid mid-range headset, with leatherette ear pads mounted onto a beefy plastic frame. The headset looks durable enough, but lacks the modern styling of gaming headsets from Razer, HyperX or Mionix. The microphone, a wiry affair, is particularly unimpressive and quickly gets kinked and messy. Boom mics might be less adjustable, but they provide considerably more style. The black ear pads can be swapped out for jauntier red ones, matching the company colour scheme and providing some visual interest. I caution you to just keep the standard ones on; I made the mistake of popping off the black ones, then spending the next 20 minutes getting the red ones re-attached. You have to wrap the fabric around the perimeter of each can, and with little flexibility in the material it’s an exercise in frustration. The Medusa’s cans can fold inwards to minimise the space it takes up, which is handy for taking your kit to a LAN – every bit of space saved helps. It’s still a heavy piece of kit though, so it’s probably not the best commuter item. The headband seems well padded to prevent discomfort, but the tight grip and relatively high weight of the headphones makes them quite uncomfortable to wear. Those with smaller heads and/or without glasses might find them better, but after an hour of wearing them I was definitely feeling the burn. Compared to other examples from Mionix and Roccat, I was sorely disappointed (pun intended). The headphones connect to your PC (or console, I suppose) via a single USB port, and are controlled via a boxy, heavy in-line remote best kept on your desk. You can adjust the balance of the speakers, choosing to emphasize or diminish the front, rear, side and subwoofer using one of four dials. There are also buttons to increase or decrease the volume, although there’s no way to see what the volume is at a glance. Finally, there’s a switch that allows you to mute the microphone — useful when you want to keep a conversation private, annoying when you forget you’ve turned it on and wonder why people have stopped listening to you. Overall, the Medusa 5.1 looks fine, but hardly makes a fashion statement. The Medusa’s trio of drivers in each can provides an authentic surround sound experience (although of course headphones will never properly compare to discrete speakers in a proper surround sound system). I’d characterise the headphones as a bit lacking in the extreme upper and lower frequencies, but mids were fine and the system certainly delivered as a gaming headset. You’ll find bassier headphones (and of course much better ones for music), but for playing competitive Counter-Strike I found them quite suitable. Where the Kudos Z-9 had surprisingly good software, the Medusa’s offering is quite disappointing. The interface offers few controls, yet is confusing to navigate. Why can’t I access the ‘Speakers’ section? What do all these acronyms mean? Can I actually enable or disable them anywhere? Why does pressing the plus sign provoke this message? There are a quartet of different audio presets available, but switching between them seems to crash some programs (e.g. VLC), which is more than a little annoying. In summary, the software doesn’t seem to work, is confusingly laid out, and actually using it crashes other applications. Hopefully we see a refined version in the future that fixes these problems. I was cautiously optimistic about the Medusa, thanks to the surprisingly good Kudos Z-9 mouse we reviewed earlier, but sadly the headphones failed to make a favourable impression. While the headphones sound pretty good, the uncomfortable fit and the dated design make them hard to recommend against similarly priced alternatives from bigger names in the industry. The Medusa could be a decent choice if you find them at a great price, but as it stands there are far better options on the market.